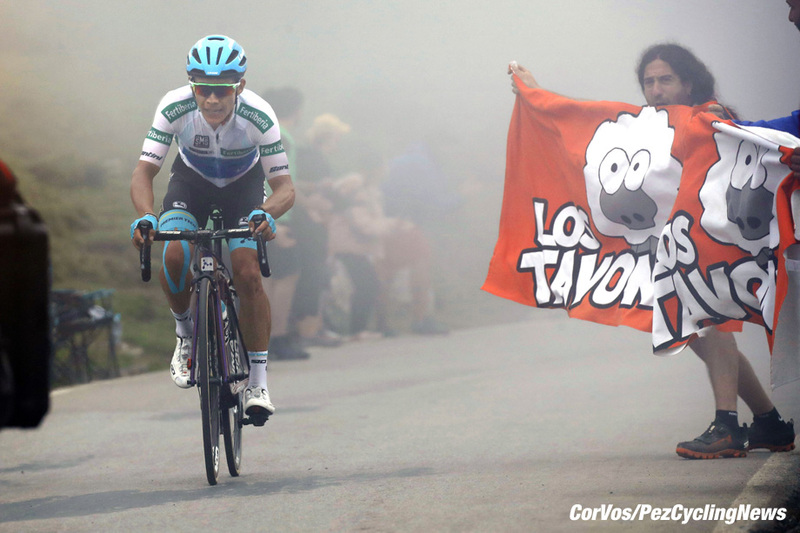 PezCycling News - What's Cool In Road Cycling : VUELTA’18: Ed’s Final Week Round Up! 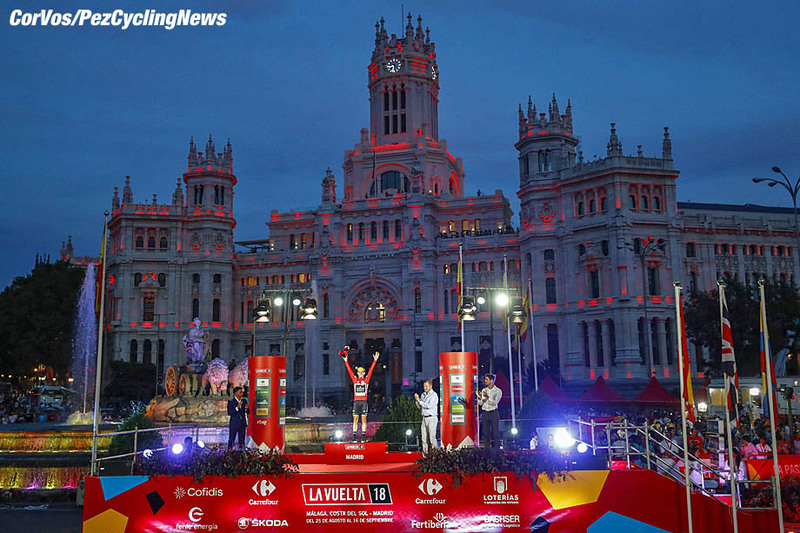 VUELTA’18: Ed’s Final Week Round Up! 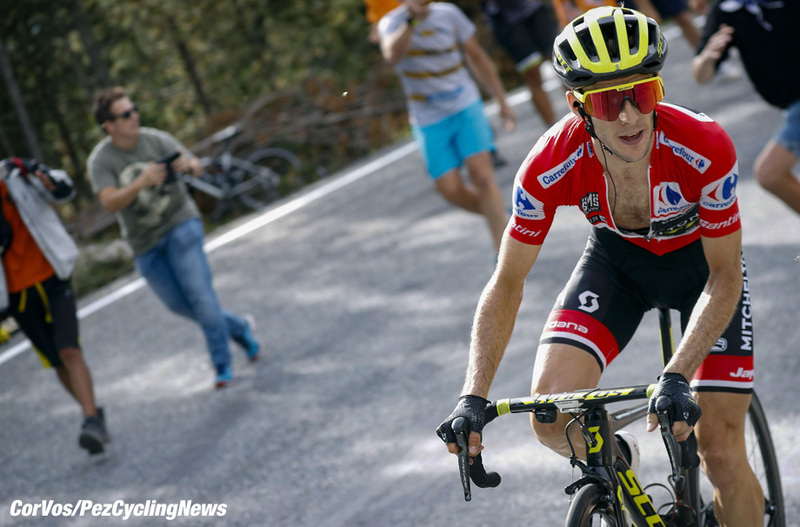 Vuelta Final Week: The 2018 came to a thunderous climax on Saturday in Andorra with a podium turn around, except for that top spot - Simon Yates held his place to make history and take a well fought battle. Ed Hood has followed all the ups and downs of the Spanish Grand Tour, here is his final summing up... the good and the bad. You can catch up with Ed's First Rest Day Round Up HERE and the Second Rest Day HERE. Plus the VUELTA’18: The First Week Photo Gallery, Second Week Photo Gallery and the Final Week Photo Gallery. 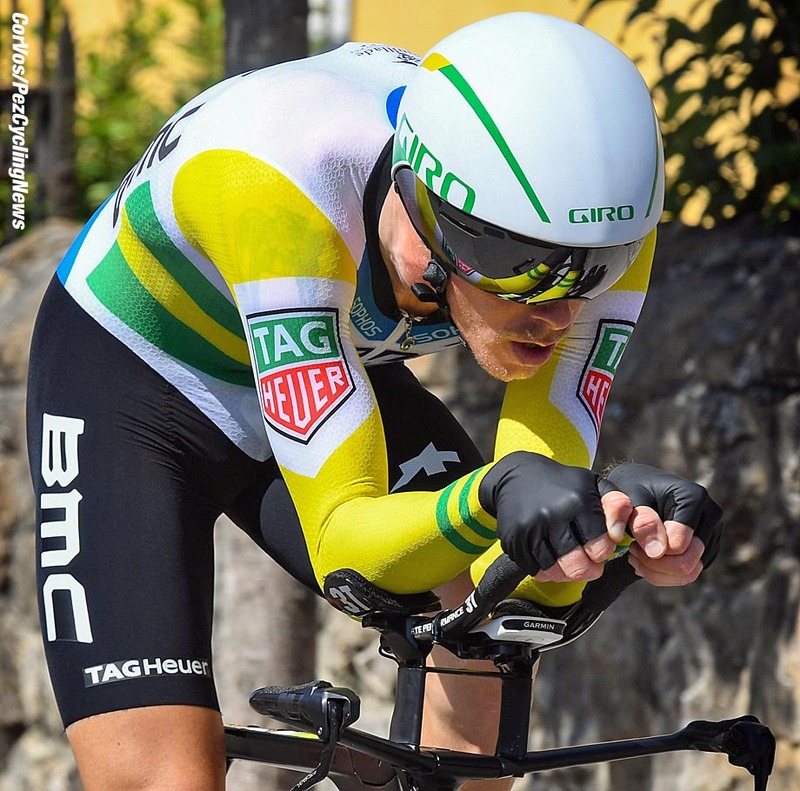 A fast big geared parcours for the second chrono so no surprises with BMC’s Aussie greyhound, Rohan Dennis taking the honours – again. Simon Yates (Mitchelton-Scott and GB) hung tight and young Enric Mas (Quick-Step Floors and Spain) gave us a clue about what was to come. Dutchman Kruijswijk (LottoNl-Jumbo and The Netherlands) rode a very good time test and moved up to a podium position. 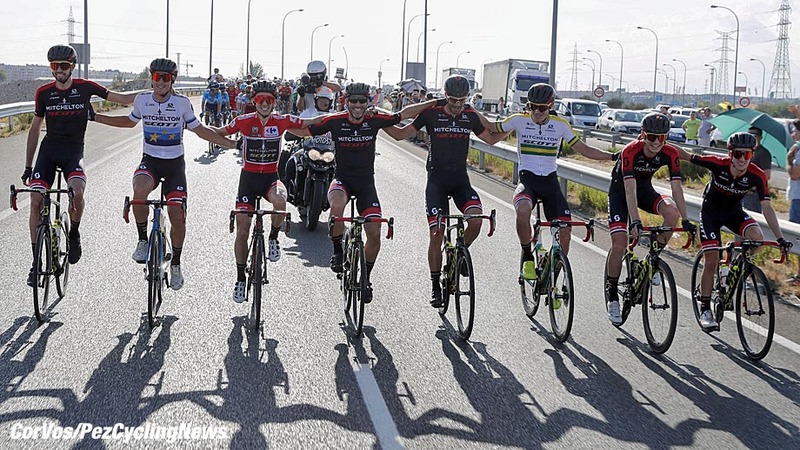 Canada’s Mike Woods made it an excellent Vuelta for EF Education First-Drapac taking their second stage win – after Simon Clarke’s - from yet another breakaway which went the distance – a feature of this race. Woods was close at Liege back in the spring and it was inevitable he’d come good and land the ‘big one’ eventually. When we saw him lose all that time earlier in the race we knew the goal was to be allowed to get in the break on a mountain stage – and so it proved. Alejandro Valverde (Movistar and Spain) flattered to deceive, taking time out of Yates but not enough to divest the Englishman of any garments. The Spaniard’s Movistar team mate, Nairo Quintana (Movistar and Colombia) meanwhile continued to bear little resemblance to the man who won this race in 2016. Meanwhile, Vincenzo Nibali (Bahrain-Merida and Italy) – who was in the big break of the day – quietly went about the business of riding into form for the Worlds. As ex-Liquigas pro and now Sky DS, Dario Cioni once told us; "it’s nice when the peloton gets it wrong and the little guys in the breakaway make it all the way to the finish." This was one of those days, with ‘not so little guy’ Jelle Wallays (Lotto Soudal and Belgium) surviving by the skin of his teeth to take the laurels. Wallays paid his dues with pro continental Topsport Vlaanderen winning Paris-Tours, the GP Criquielion and Dwars door Vlaanderen in their colours before moving up to the World Tour. 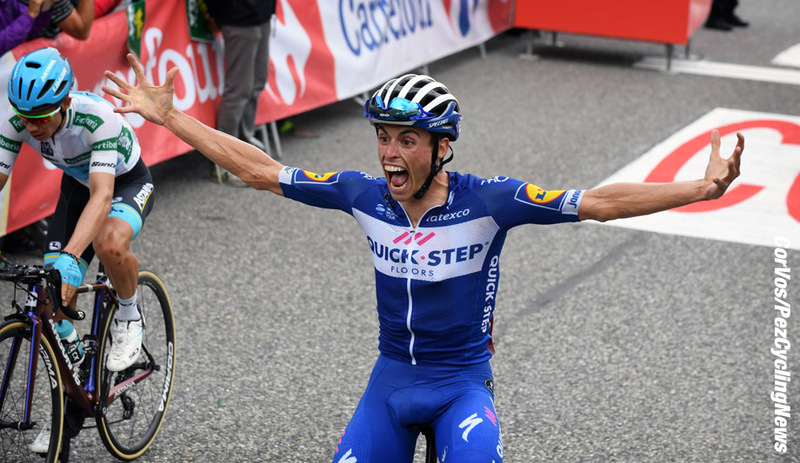 This was his first win since a stage in San Juan way back in January but it transforms his season – a Grand Tour stage win is always a good calling card. 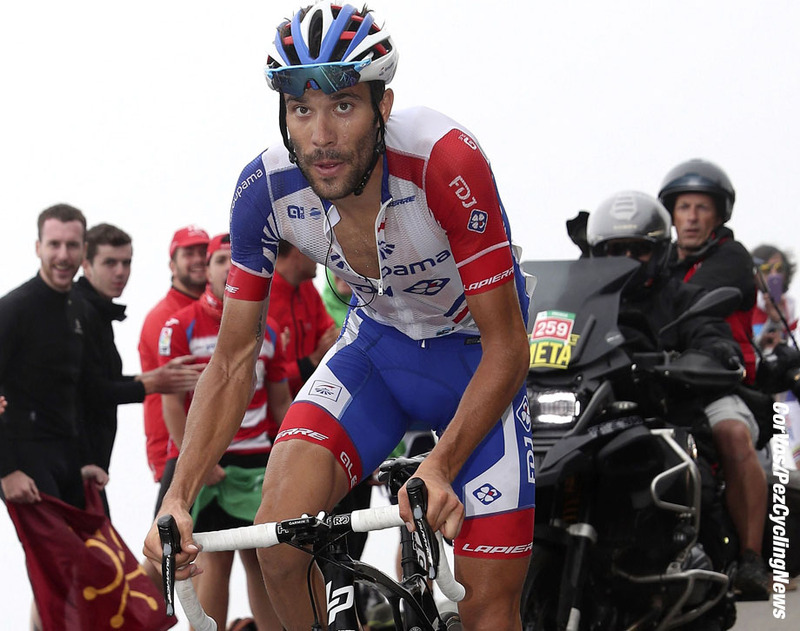 Can Thibaut Pinot (Groupama-FDJ & France) win a Grand Tour? Probably not. But he can serve up dashing, ‘old school’ stage wins. Chapeau! He took his second of the race and saved his season. Kruijswijk rode well again as Valverde began to fray around the edges; will we witness his customary ‘jour sans’ tomorrow? ‘Yes’ was the answer as the man in the green points leader’s jersey crumbled and slid down the standings to fifth on GC. It would be wrong to say that Kruijswijk crumbled, it’s just that Yates, Mas and Lopez were all younger – and better. But who is Enric Mass (Quick-Step Floors and Spain)? He certainly didn’t figure in the Vuelta PEZ Preview. He was a talented U23; his 2016 was classy with a stage win and the GC in the early season Portuguese Volta ao Alentejo; he also won the Tour de Savoie Mont Blanc in France and he was second in the Giro Ciclistico della valle d’Aosta in Italy – both big shop windows for the professional talent scouts. At the head of the queue was Quick-Step Floors who signed him for 2017; he quickly found his feet in the WorldTour with second in the Vuelta a Burgos to that erratic talent, Spaniard Mikel Landa, who was with Sky, last year. 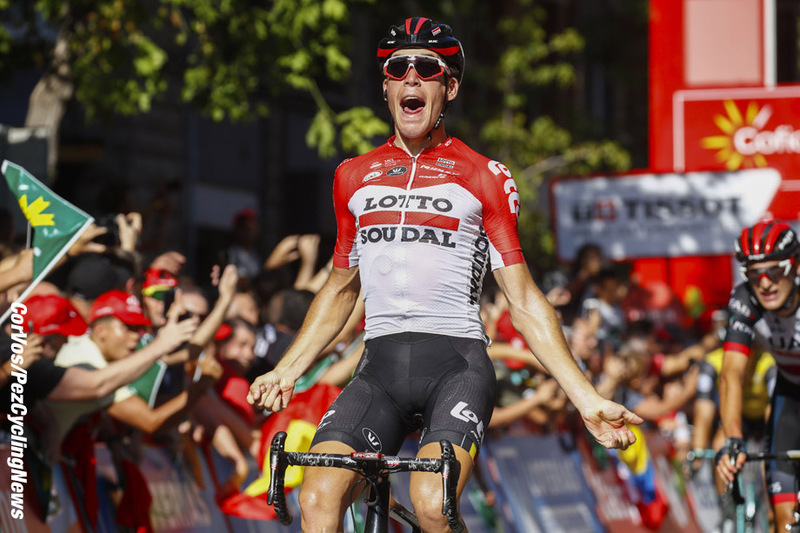 The Belgian flooring team ‘blooded’ the young Mas in the 2017 Vuelta and this year he gave warning of his talents with a stage win and fourth on GC in the Tour of the Basque Country and fourth on GC in the Tour de Suisse. A stage win and second spot on GC podium in a Grand Tour as a second year pro speaks for itself – but let’s not get too excited. He has to deal with the draft from the fluttering cheque books, fast cars and night clubs before he’s, ‘the next Contador’. Miguel Angel Lopez (Astana and Colombia) is another young man who, if he maintains his current trajectory must top a Grand Tour podium. But that said, a year or two ago it looked as if it was only a matter of time before Quintana topped the Tour de France podium – something that’s an unlikely prospect now. 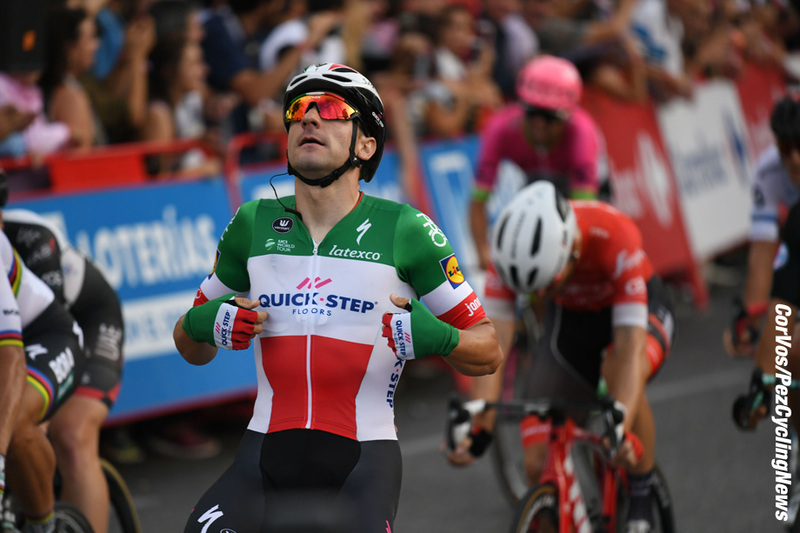 However, Lopez record this year is straight out of the top drawer: a stage and second on GC in the Tour of Oman, third on GC in the Abu Dhabi Tour, a stage win and third on GC in the Tour of the Alps, third on GC in the Giro, a stage win and second on GC in the Vuelta a Burgos and now third in the Vuelta. The stats speak for themselves. Quick-Step Floors – on the subject of stats, those flooring boys numbers are exceptional. 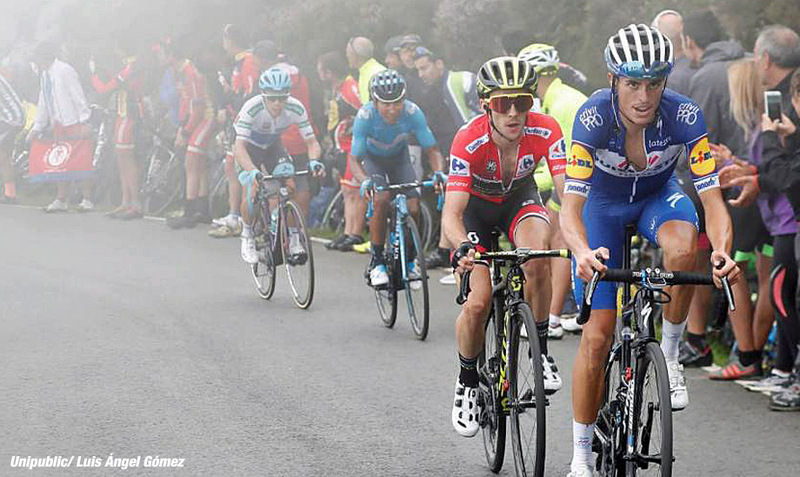 Viviani’s victory in Madrid was number 65; meanwhile up in Slovakia, Fabio Jakobsen was making in win number 66 on the final stage whilst Julien Alaphilippe made it 67 by taking the overall in the race. No further words required except that the super cool Italian Champion’s win was his 17th in 2018 and makes him the biggest winner of the year. Stunning. Yates finished off what he started at the Giro – no surprise. Richie Porte (BMC and Australia): Stomach problems before the race even started – the ‘Nitemare on Grand Tour Street’ continues for the man from Tassie. 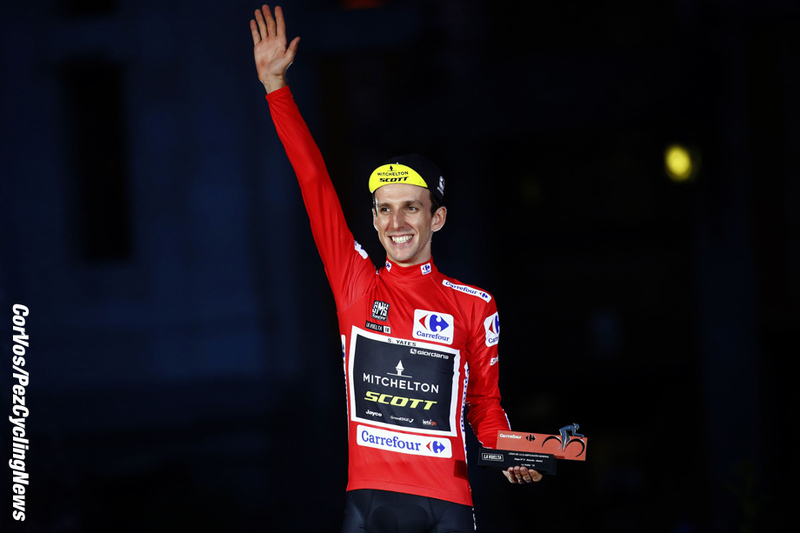 Simon Yates (Mitchelton-Scott and Britain): ‘The win is possible’ – we got that one right. Nairo Quintana (Movistar and Colombia): ‘Doesn’t seem to sparkle like he used to’ – another one we got right but it gives us no pleasure. Alejandro Valverde (Movistar and Spain): Fifth on GC, two stages, lead the winning team and won the points jersey – not a bad ‘failure’ if you ask us. 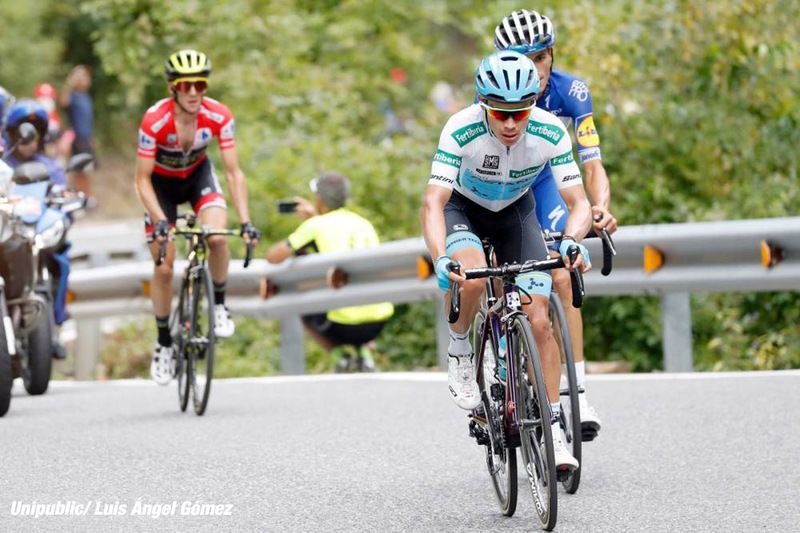 . .
Miguel Angel Lopez (Astana and Colombia): We worried that maybe there had been too many stage races for him, this year – we needn’t have. 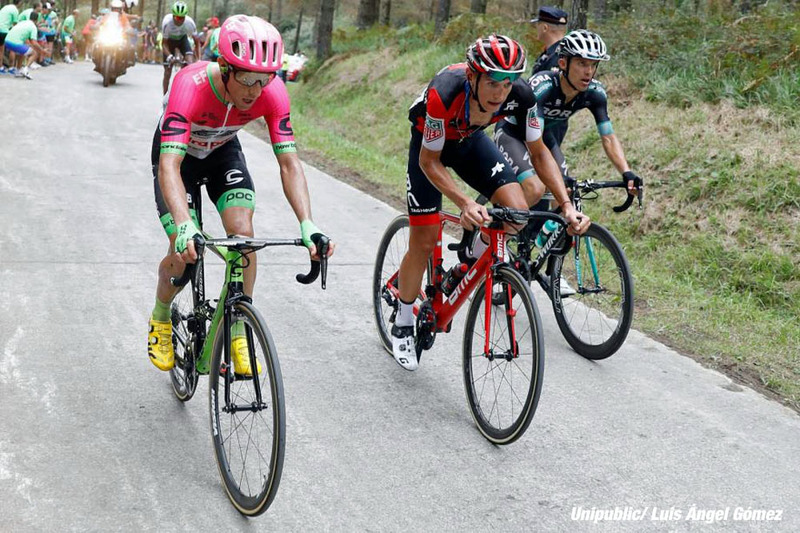 Rigoberto Uran (EF Education First-Drapac and Colombia): Finished seventh and the team took two stage wins so Mr. Vaughters should be happy enough? Fabio Aru (UAE team Emirates and Italy): Hard to believe that this is the man who ‘mugged’ Dumoulin to win this race in 2015 – 23rd at an hour plus. 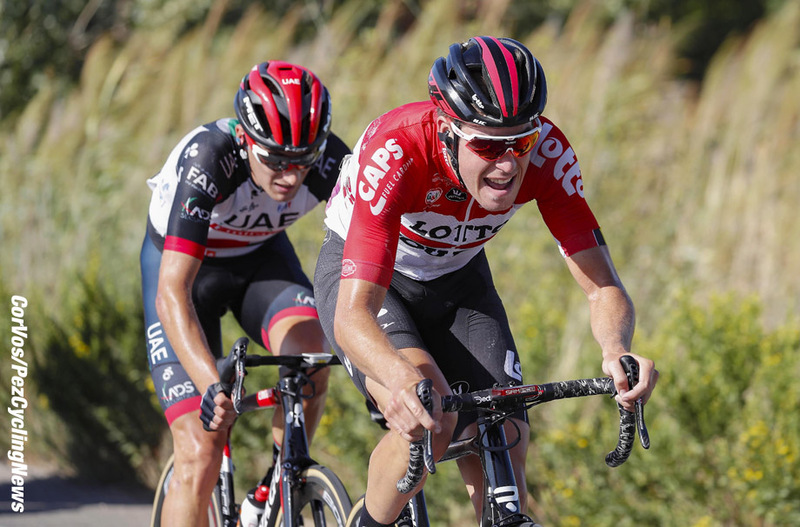 Wilko Kelderman (Sunweb and The Netherlands): He finished 10th, little else to say. Vincenzo Nibali (Bahrain-Merida and Italy): We think he’ll have more to say come the Tyrol in a fortnight. KOM: Thomas De Gendt (Bel) Lotto Soudal. Combined: Simon Yates (GB) Mitchelton-Scott. Combativity: Bauke Mollema (Ned) Trek-Segafredo.